“We may be going to war with Russia.” they say with a mix of anger, disgust, and worry. I was almost ten years old hearing something I only vaguely understood. I did knew the Reds were bad, or at least all the news, my parents, and their friends said so. I was too young to remember Joe McCarthy’s pontificating but things seep into the consciousness. Hastings’s daily newspaper (Sundays excluded of course), the Hastings Tribune, was tossed up on the porch by boys riding bikes. They got the newspapers folded in half, then they’d quickly fold them into thirds and tuck one end into the other making an 8-inch square that could easily be thrown like a Frisbee. These got loaded up in their cloth bags which were put on the handlebars, they rode off, and thudded newspapers onto the porch every evening. I loved the smell of them and the comfort of its regularity. But in all those papers, over all those years, the only thing I can remember seeing was a political cartoon of Soviet Premier Nikita Khrushchev driving a tractor in a field with our president entangled in the rows and plow blades as Khrushchev says, “We will bury you.” I was frightened hearing my father explain how Khrushchev wanted to destroy us and everything we loved. Now with missiles in Cuba it seemed to be coming true. Scientific research over the last couple decades has caused me to think a lot more about memory. And Walt. Walt was my father-in-law and past president of the Nebraska Elks. He was at one of their meetings when something happened, probably a stroke. While out driving he suddenly slowed down on Interstate to do a left turn. Instead of getting a turn he got a semi-trailer truck rolling up the back of his camper van destroying it. The accident shut the Interstate for an hour. Science tells us that we have at least two memory systems. There’s the short-term one that remembers a few things a few seconds, and the long-term one that remembers lot’s of things indefinitely. Somehow the short-term is handed off or becomes the long-term. This became so clear with Walt. Physically he seemed the same but it was quickly obvious he could now longer remember anything past a few seconds. It became a mental ordeal to pick Walt up from his apartment and take him to a family gathering. It was the conversation that challenged me. “Hi Walt, ready to go?” I’d ask. “Well yes. Say where’s my van?” he’d reply getting into my van. “It was totaled in a traffic accident you had a year ago?” I’d say. “Oh?” Then a pause, then we’d start in the circle again. “Do you know where my van is?” he’d say. I realized that memory is as basic as breathing and we take it for granted way too much. For instance, memory is absolutely critical for a good conversation. By the fifth time, in a ten minute drive, I was asked about what happened to his van, I could hardly speak I was so frustrated. I also realized how he could remember events from long ago but not from five minutes ago. It was obvious two memory systems were at work. And finally I realized that we think in circles, one thought triggering another until like the lost child in the woods, we stumble back to where we were. For Walt the important things where his van, and the state capitol (for as long as it was in view) and thus we stumbled back and back to them. Science and Walt have caused me to think about my memory and how well I actually remember things, and in what form I remember them. The epiphany came a few years ago when I returned to Philmont Boy Scout camp in northeast New Mexico. The first time I went was a pivotal event in my life; I felt rich in memories of it. When I returned I realized how little in fact I did remember. I took almost the exact trail I had nearly 30 years earlier. At times it seemed familiar. Often it was not, and I realized memories came back in different forms. Some of them were “videos”, short clips of information, some with “audio” others without. If I strung them all together in my head I thought I could make a “Video Highlights of Philmont 1970” last 10 minutes. Maybe. If I was lucky. Ten days of rich memories backpacking and I get 10 minutes of video highlights. Then there were the “photographs”. No words, no motion, just an image in my head of something, some event. Other memories are more like ghosts with nothing left but the idea I had a feeling, an apparition of an emotion at the time. There are the factoid memories, things like “I think he said he was tired.” No image, just an idea of an idea. Finally there are clearly the olfactory memories. Scientists tell us that the nerves for smell are deeply connected to our memory centers, one of the most ancient of neurological circuits. When I smell a German magazine I’m suddenly seven again and looking through an S&H Green Stamps catalog to trade those stamps that filled our drawers from every grocery purchase into something useful. Is it the dyes? The paper? I’m not sure but German magazines nail it for me and suddenly I can see and hear the grocery store cashier pressing those buttons on that tan machine causing it to roll out green stamps. Now maybe what I describe can begin to make sense. And it is really very little for such a monumental event in history, nearly the end of history. The biggest memory is a couple days after Kennedy’s speech on TV. 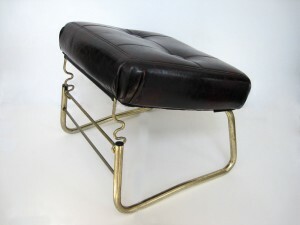 I am draped, in my usual way, over a footstool watching the TV (video memory). The show is a weekly series on careers. I rarely watch it (my factoid memory), perhaps this is the only time. It is about being a horse jockey. Out in the kitchen I hear my dad reading from a booklet the Post Office had handed out (factoid memory). It has a yellow cover and is called Fallout Protection. Occasionally I hear uncle John, my dad’s business partner and mom’s brother, his wife Verna, and my mom. They are asking questions of my dad, who knows a lot about science, about what this and that mean in the book. They are anxious (emotional memory). They talk about how we could try to survive for two weeks under workbenches topped with the weight of dirt and books. They wonder if the whole city might be evacuated to the bomb igloos on the east side of town. The world is ending and I am watching a man hugging the neck of his race horse. 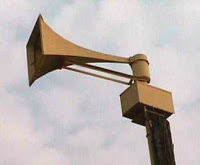 Hastings didn’t have civil defense sirens during the crisis and it would be a few weeks before they did. So when the Russian planes and missiles came the police and firetrucks would go through the city with their sirens wailing. Until then they would be silent so as not to alarm the citizens; until then we were to be on the watch for their flashing lights. The general consensus of our family’s social circles was Hastings might be important enough to be a target. 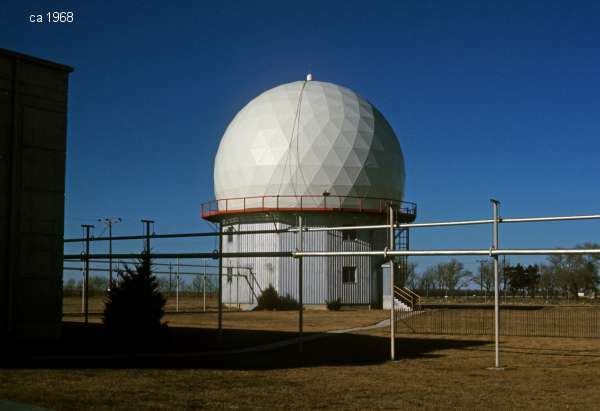 After all we had the Naval Ammunition Depot, and the Air Force’s radar domes, and who knew what those domes were doing and how important the Russians would think they were. There was talk of using the Naval Ammunition Depot igloos, which held bombs the depot manufactured during WW2. They looked like heavy concrete and earthen covered structures and could probably protect the whole city. Years later I’d be in an astronomy club meeting. 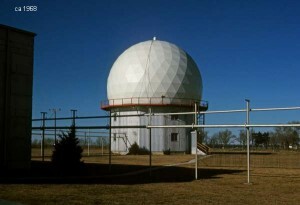 The club owned a missile silo south of Lincoln, Nebraska where our family would set up our telescope for some of the quietest nights of my life. A man spoke up at the meeting about the silo. He lived near Lincoln, a major Air Force base at the time of the crisis, and was driving by the site to find the missile out venting steam, ready to launch at a moment’s notice. 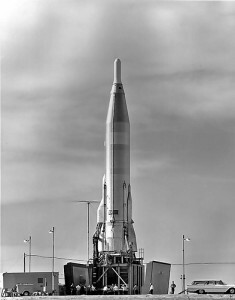 It likely had a 3.75 megaton warhead, more power than all the bombs dropped in WW 2. “What’d you do?” he was asked. He looked down a moment and shook his graying head, “I drove on and went fishing. I thought it might be the last time I’d ever do it.” Profound statements are often simple statements. Buddhist ask what do you do after enlightenment? The answer: “Chop wood, and carry water.” Life goes on, we go on doing what we do. We went fishing. We worked on cars. We played football in Deal’s empty lot. Perhaps that is why I remember so little. Life went on. My only other memory of the crisis is a month later. Skies are azure blue and filled with contrails. An odd looking plane rumbles overhead. I’m with mom and dad, and now with uncle Andy and aunt Louise. We are on the road to the Ozarks for Thanksgiving with family. But at this moment Andy tells us, as we stare into the sky, that the planes are coming back from Florida, war has been averted and I remember being thankful and saying so. The crisis was averted but there were echos of it for years. The Thunderbolt 1003 sirens arrived in Hastings and once again speeding tickets could be given and fire trucks could rush to fires with sirens loudly proclaiming their location. It was a relief and fun to hear them again. A new routine began. Cities had to each have different times to test these alarms, least the Russians take advantage of us, so Hastings picked noon on the first Saturday of each month. The term siren comes from Greek mythology were they are femmes fatales, singing a song on a rock by the sea and attracting sailors to the rocks where they perished. In The Odyssey Odysseus takes his ship by them, but ever clever, he puts wax in his sailors’ ears so they can’t hear the song and has himself tied to the mast so that he can. I could understand the myth for I was attracted to this odd sound portending death. Occasionally I’d ride my bike over the power and light plant to listen to the sound up close, then ride home for lunch. Unlike modern sirens these had a throaty sound, especially as they stopped, that’s hard to describe. The wail was overlaid by something that vaguely sounded like the purring of a giant cat. Hastings contribution to the military industrial complex with those radar domes to the east of the city, and the Radar Bomb Scoring unit near them. The radar closed a few years after the crisis but before it did I had a tour of them and learned about microwave cooking for the first time. The airman tour guide described how they’d throw up hotdogs into the radar and they’d fall back down cooked. Years later I have wondered if he and many others have cataracts of the eyes from their cooking. The bomb scoring continued in service for decades. Driving into Hastings on the old highway I’d occasionally see B-52’s flying a few hundred feet over the cornfields. These planes were first flown the year I was born and are expected to fly for nearly a century. But over these cornfields they were practicing Armageddon and being scored like a football game. 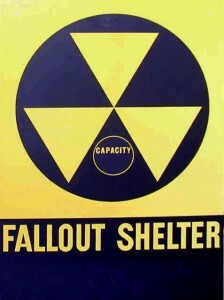 Shortly after the crisis fallout shelters with the appropriate signs were designated and supplied. We were lucky to only have to rush a few block to the House of Yesterday for our neighborhood shelter. Some in town had their private one built. During the summer before my high school senior year my first girl friend told me they’d built one but turned it into a wine cellar. How nice, I thought, to be at home and able to drink ones way through a crisis. That same summer I stopped by the Civil Defense office to see if they still had those yellow fallout shelter books. I walked out with a new one and training materials for becoming a fallout shelter manager. Why not? It was simple training and I was certified in a week. Then and since I’ve tried to imagine how well the shelterees would deal with a high school senior as shelter manager. Not well I suspect. How well would all this preparation have worked? Look at an old radio and you see the CONELRAD triangles on the AM band at 640 & 1240. All radio stations were to go to these two frequencies during an attack so bombers couldn’t use radio stations as a beacon. In 1971 this system was accidentally activated. I didn’t hear it but my dad told me the DJ for Hastings KHAS radio was really shaken up announcing the station was waiting for a presidential emergency message. It turns out Hastings was one of the few stations to actually do what they were supposed to do. Most others never got the message, or even more interesting most of those that did ignored it. I had a moment of my own that was an accident and a moment of terror. It was in eighth grade watching a film strip. These were rolls of 35mm film put in a project. A record player would play, a narrator would speak, and then every once in a while he’d stop and there’s be a beep. The person at the projector would turn a knob to the next slide. As the class watched this the fire alarm sounded. Nothing unusual, just the monthly test were we’d all walk in an orderly way outside. As I was walking by the projector suddenly I heard that throaty purring sound of the siren, and just as suddenly my stomach felt that fearful pain. This wasn’t a fire alarm but with the whole city being alerted, it meant something much bigger was happening on this sunny afternoon. A moment later I realized the sound of the siren was really just the record coming to a stop making the narrators words drop in tone and become that purring sound. That was my only moment of annihilation terror for me and my community I’ve ever had. It’s hard to predict what the next big disaster will be. Few imagined 9/11 until it happened. And reading about the history of the Cuban Missile crisis now, we find that reporters were called into duty as emergency diplomats by the White House. We were so close to the edge, so very close to missing turkey in the Ozarks. We’re now in a global climate change event, and likely the fifth identified Earth extinction event. India and Pakistan’s small nuclear arsenals are said to be capable of initiating a brief global winter starving a billion people to death. New teen bio-hackers might make a more deadly smallpox. I don’t know what will happen except that people will do what people need to do. Go fish.